Aston Harald Sports, the rights owner of the M32 Series for M32 catamarans, has launched the M32 Series Mediterranean. This series will start in June in France followed by events in Riva Del Garda, Crotone in Italy, with the finals to be held in Spain in October. The M32 Series Mediterranean will be managed by events company BPSE based in Milan, Italy and headed by prominent Italian sailor and event director Riccardo Simoneschi. 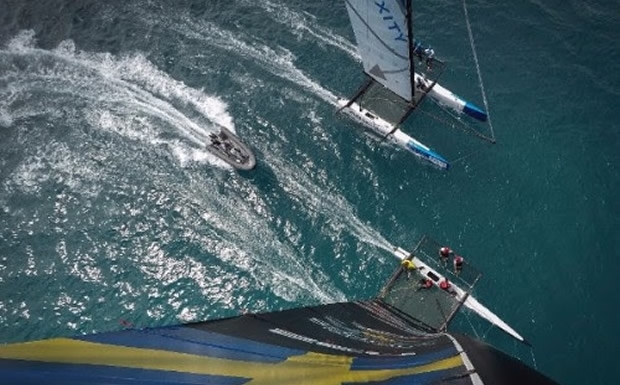 BPSE has run a number of high profile projects in the TP52 and Star classes, and most recently the successful Audi Tron Sailing Series for the Melges 32 class. Simoneschi commented: "We are super-excited to join the M32 World and bring the M32 Series to the Mediterranean. The format fits perfectly with what we've built with the Audi Sailing Series and there are many talented teams around the Med that are eager to show their skills in the M32!" Teams from Italy, France, Spain, Scandinavia and the US have already registered their interest in joining the five-stage Mediterranean series. Swiss match racer and skipper of EFG Bank Sailing Team, Chris Rast, and Guido Miani from the Yacht Club de Monaco, are both looking forward to the start of the series. "We can't wait to start racing the M32 this summer. This will for sure be a very tough, but fun racing series in some great locations," commented Rast, who has a newly formed team based in Geneva. Miani added: "The high speed [America’s Cup] style fleet racing is fun for both the sailors and the audience and we're ready to put on a show! We want to get in early to establish our team as a top team on the series."